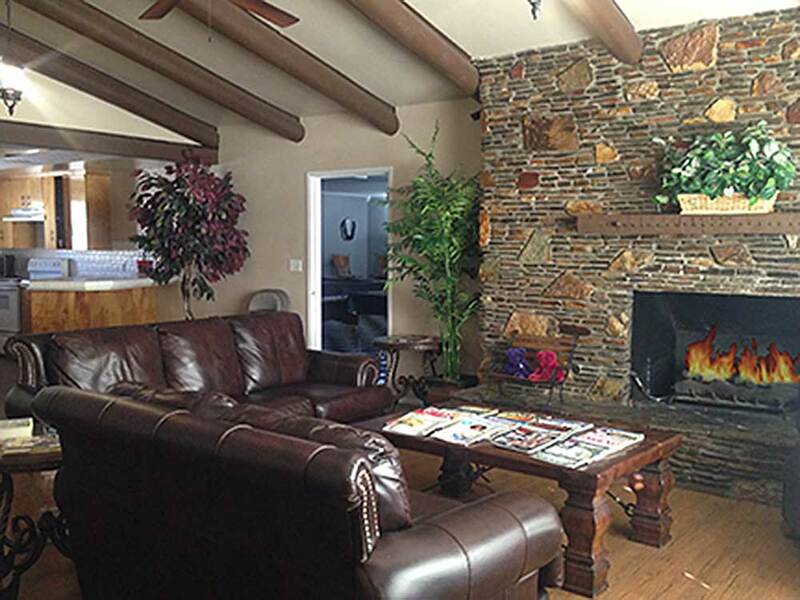 55 and over resort in Prescott Valley with a mix of pre-fab park models and RV spaces. There are paved driveways with a gravel site pad. The site was a huge pull-thru, probably the widest site we’ve ever been in with full hookups and a picnic table. We were visiting friends in Prescott so we didn’t spend much time in the park but they have nice facilities with clean restrooms. We paid $39.59 per night. This is a mobile home park although they do have about 30 overnight RV spots. All RV spots are NOT pull throughs so best to call ahead and make a reservation. Good Sam book says they have 300 pull-throughs but 90% are used for mobile homes. This is one of the nicest, cleanest RV resorts we've had the pleasure of visiting. The spaces are large pull through and easy hookups. We visit here every so often and always greeted with smiles and everyone is so willing to help. There are so many activities or just sit and visit with other guests which we really enjoy. We had another wonderful visit and really enjoyed! Perhaps "Stepford Ranch" would be a more appropriate name. First, the list of rules and regs is a mile long. When I finished reading all the do's and don't, I was pretty tired. Second, be warned: most of the people at this park are permanent residents, and some don't take kindly to "strangers," meaning new people. There is a marked lack of trust. We encountered daily questions as to who we were and what were we doing in the park. Conform and act a certain way, and all goes well. But step away from the expected pattern and suffer the consequences. True, the fearful and suspicious behavior of the residents is justified to a certain extent: it is a vulnerable population who could be harmed by TRUE strangers with ill intent. Downside: people who are suspicious and afraid can react with anger. The ones I encountered certainly did. One evening I was harassed so badly that I resorted to calling 911 because I feared for my personal safety. Credit to the manager, who was able to calm all concerned and reassure the angry residents that we were, indeed, paying for a spot. The bathrooms are immaculate. Pickle ball is a great game. There are free donuts on Wednesday. It is a clean and well-organized park. The "free" wifi comes and goes, so have a sense of humor if you get online in the "clubhouse." I found most of the staff to be responsive; again, especially the manager. What had me upset was the extreme rudeness and appalling angry behavior of some -- certainly not the majority -- of the residents. If you are in any way an individualist, or someone who is not constantly cheerful and outgoing whenever in public, I'd say steer clear of Orchard Ranch. Had the worse stay in my 25 years of Good Sam RV camping. This is a nice park, good water pressure, good power supply, pull thru spaces nice. I was all set up / I'am RVing. Let's start planning our stay OOP'S Experienced a water outage (2 hours) No notification No update to the day campers. Went to the office to check, WRONG thing to do. Treated me like I was stupid, YES the water is off AND ? Wow! Saturday morning, four electric utility trucks pulled up inside the park. New power poles (2) were set, new transformer. Had no electricity 9 am to 5 pm. No notice again. Office said it wasn't planned. Hmmmm! A Lot of equipment for not being planned. Had to pay extra for internet at my site. No power to the park.Lost some money there. Monday, Water off again. No courtesy notice. Went to the office, First thing out of their mouth Don't start yelling. WOW ! Good Sam needs to follow up on hospitably here. K.O.A. would never put up with this kind of treatment to there guess. Sorry, not a complainer, but this was not acceptable. This park refused our stay due to having a service dog and their undue professionalism on breed identity. They took one look at my service dog and "assumed" he was a bully breed dog. He is not of a bully breed and they refused to look at his vet records as to his breed. This resort has been reported to the Department of Justice ADA division. They have no respect for disabled veterans and their service dogs.